The usual Mumbai underbelly films are about cops versus gangsters; Kabeer Kaushik’s Maximum is about the internal workings of the police force and inter-departmental rivalries, that bloat the body count of gangsters, informers and other cops. Politicians, builders and dons operating from foreign hide-outs run operations in cahoots with corrupt cops. In Kaushik’s film, a dreaded top cop and encounter specialist like Pratap Pandit (Sonu Sood) is not necessarily honest. He has its own irons in many fires, and is not averse to some wheeling dealing. You get to see his life and working in some detail—he has a bunch of loyal teammates and informers, a nice wife (Neha Dhupia), a mistress (Anjana Sukhani), a tennis-playing daughter and poetry-spouting father. He alsohas his Lucknow connections in a TV reporter (Amit Sadh) and a politician(Vinay Pathak) trying to make his way up the slippery ladder as an ‘outsider’. Pandit’s chief adversary is Arun Inamdar (Naseeruddin Shah), a dour man with another minister (Mohan Agashe) in his camp. Pandit and Inamdar are also the state police force’s trigger happy cowboys, and people drop like flies, and shady builders and growling dons hover at the periphery. There is an interesting and perhaps novel idea there, about how cops get into a destructive power game, but in reality one has never heard of this internecine warfare spilling into the streets in a public bloodbath—one of them on a deserted platform with an empty train pulling out,so much for detailing! Kaushik has a jittery narrative style, that does not allow for adequate time or attention to be invested in any aspect of the plot, so the film, jumps from one incident to another without letting anything sink in. And there is no character to root for as the film tries to capture the changes in criminal operations and police functioning from 2003 to the present. (Time is conveyed by a voiceover and two characters starting to wear glasses). Ultimately it is a cliché-ridden and boring. (How many shots of local trains! How many sequences in dance bars!) Pity, because Kaushik directed Seher, which can be listed among thebest cop films made in Bollywood. Sonu Sood wears a bemused expression and speaks with an annoyingly slow drawl. 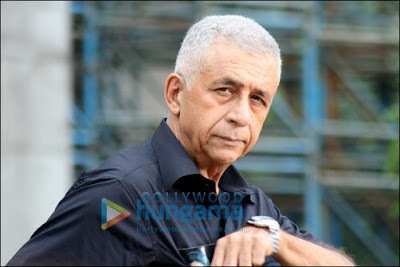 Naseeruddin Shah he wears a glum look throughout. Both actors deserve better.